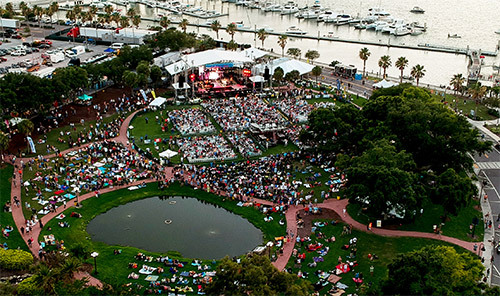 Enjoy a spectacular four day-four night, world class, live, music festival at Coachman Park in Downtown Clearwater. Now in its 37th year, with an average annual attendance of 35,000 people, Ruth Eckerd Hall On the Road presented the best-known headliners since 2006. Clearwater Jazz Holiday’s modern-day, diverse line-up covers a wide array of musical styles: smooth jazz, swing, blues, jamband, rock, folk, Americana, funk, and Zydeco. The Festival covers all age groups and genres, showcasing new artists, emerging stars, and classic legends including Tony Bennett, Earth, Wind & Fire, Chicago, Bonnie Raitt, Sheryl Crow, Trombone Shorty and The Avett Brothers. 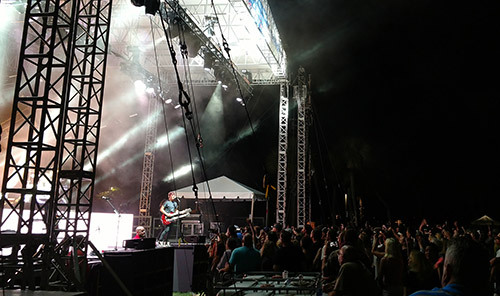 Located in sparkling Downtown Clearwater, this waterfront, open-air venue provides a magnificent backdrop for concerts and festivals throughout the year. Listen to some of your favorite national recording artists perform on the Charles Wharton Johnson Pavilion, while you take in waterfront views and stroll along the beautiful Downtown Clearwater walkways. Learn more about the future of Coachman Park. Click play to view the video below. From Tampa – Take I-275 south towards SR 60 (Gulf to Bay, Courtney Campbell), towards Clearwater. Follow SR 60 through Downtown Clearwater. Turn right on Osceola Ave. The Park is located on the left-hand side. From St. Petersburg – Take I-275 north towards SR 60 (Gulf to Bay, Courtney Campbell), towards Clearwater. Take Exit 30 for FL 686 west/Roosevelt Blvd. Keep left to follow signs for CR 296 west and merge onto 118th Ave north. Take US Highway 19 north towards Clearwater. Take Exit for Drew St west. Follow Drew St west through Downtown Clearwater, to Osceola Ave. Turn right on Osceola Ave. The Park is located on the right-hand side. Ample, public parking and metered parking is available in Downtown Clearwater. For more information on public parking locations, please refer to the City of Clearwater’s Downtown Parking Facilities Map. During events, Handicap parking is available on a first-come, first-serve basis and is located at the bottom of the hill, Lot 14. Lots 2 and 5 require event parking passes. These lots are accessible through the Clearwater Main Library/Winter’s Dolphin Tale Adventure parking lots, on Osceola Ave. Downtown parking meters are not enforced Monday-Friday after 6pm and all day on Saturdays and Sundays.